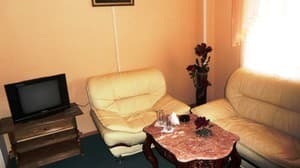 The hotel "Buhta piratov" is a comfortable and cozy hotel, located just 15 km from the stadium "Donbass Arena" in Donetsk. 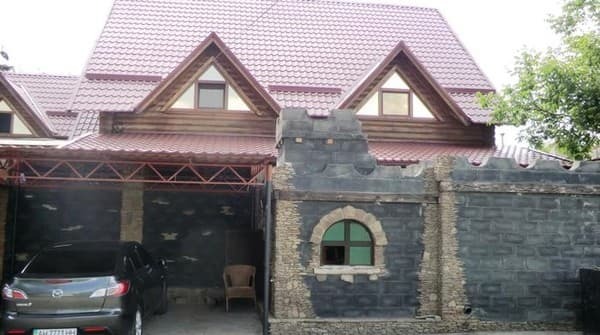 Hotel and leisure complex "Buhta piratov" offers the guests 8 comfortable rooms with an elegant interior. 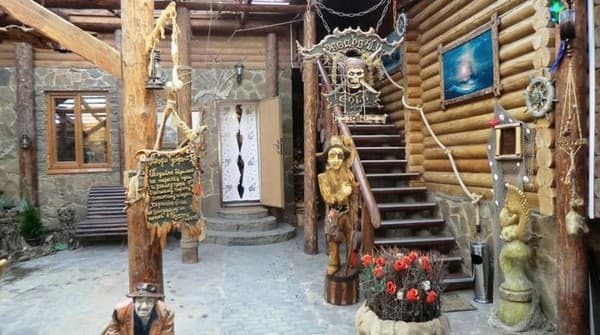 "Buhta piratov" has a Russian bath from a snowdrift, sauna on firewood with besoms, billiards, pool (4 * 3, heating, lighting, filtration, waterfall), a hot tub with light and modern water purification system, aromatherapy , floor heating, a stylized pirate patio, friendly service, home cooking, Arabic hookah, fireplace, grill for barbecue, guarded area, parking and more. In the bath works a professional masseur. Description of the room: Double Junior Suite "European", with a total area of ​​25 square meters. with a wide double bed. The room has everything you need: WI-FI, mini-bar, shower, TV, telephone (mini-ATS), air conditioning, hairdryer, iron, bathrobe, work desk, bathroom accessories, toilet, bathroom, heating, slippers, satellite TV , fridge. Description of the room: A small but very bright room with a large roof window and a view of the sky. The walls of the room from beige to brown create a relaxed and easy environment for relaxation. At night, on the front wall and ceiling, stars, planets, and their satellites are lit. The room has a telescope. 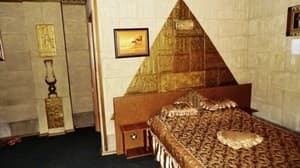 Description of the room: Double junior suite "Egyptian", the total area of ​​25 square meters. with a wide double bed. The room has everything you need: WI-FI, mini-bar, shower, TV, telephone (mini-ATS), air conditioning, hairdryer, iron, bathrobe, work desk, bathroom accessories, toilet, bathroom, heating, slippers, satellite TV , fridge. 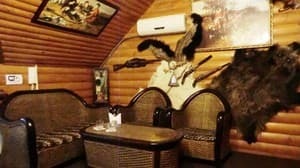 Description of the room: The room is made in the style of a hunting hut: the walls are lined with the skin of wild boar and lamb, decorated with horns and stuffed animals, beautiful paintings of Tsar's hunt, mock-ups of guns and pistols. 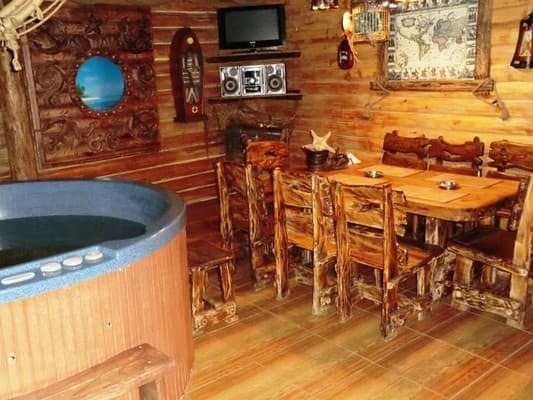 Double suite "Tsarskaya Hochta", the total area of ​​30 square meters. with a wide double bed. 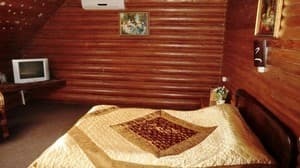 The room has everything you need: WI-FI, mini-bar, shower, TV, telephone (mini-ATS), air conditioning, hairdryer, iron, bathrobe, desk, bathroom amenities, toilet, bathroom, wide bed (more than 2 meters), heating, slippers, satellite TV, refrigerator. Description of the room: Double suite "Black Pearl", a total area of ​​40 square meters. with a wide double bed and a sofa bed. 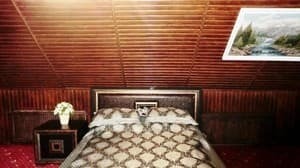 The room has everything you need: WI-FI, mini-bar, shower, TV, telephone (mini-ATS), air conditioning, hairdryer, iron, bathrobe, work desk, bathroom accessories, toilet, bathroom, wide bed (more than 2 meters ), heating, slippers, satellite TV, refrigerator. 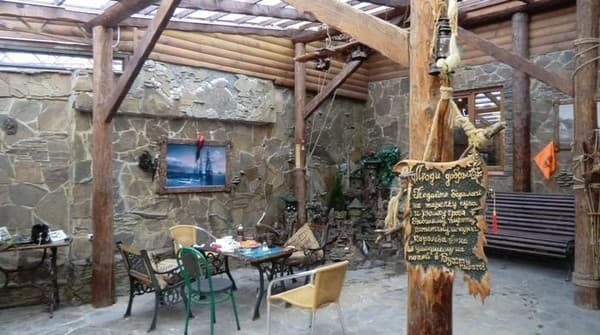 Description of the room: The interior of the Greek room includes: antique columns, stucco molding, fireplace and a beautiful landscape on the walls. Double suite "Greek", the total area of ​​40 square meters. with a dimmed double bed and a sofa bed. 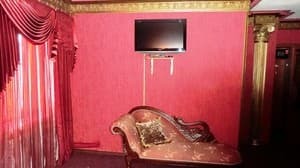 The room has everything you need: WI-FI, mini-bar, shower, TV, telephone (mini-ATS), air conditioning, hairdryer, iron, bathrobe, work desk, bathroom accessories, toilet, bathroom, wide bed (more than 2 meters ), heating, slippers, satellite TV, refrigerator. Children up to 6 years stay free of charge. Extra bed - 200 UAH. 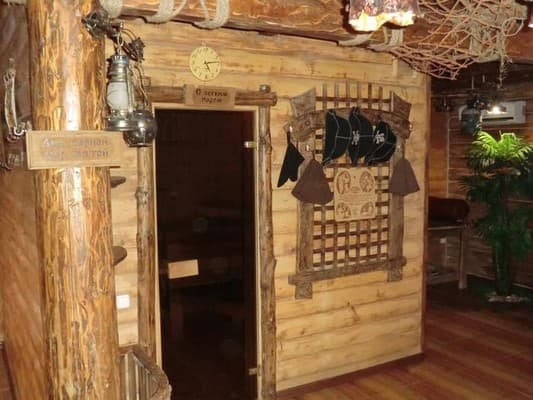 The hotel "Buhta piratov" is located in Makeyevka in the city center, next to the nightclub "Continent", Wedding Palace, City Prosecutor's Office. The hotel "Buhta piratov" in Makeyevka is located in one of the central streets of the city - Dzerzhynskogo street. You can reach the hotel from Donetsk Southern Bus Station by minibus № 111, from the covered market – minibus №121.